There are two faces to Hulu, the online video hub owned by the parent companies of ABC, Fox and NBC. Hulu is a destination for next-day repeats of TV shows that have already aired on those and other networks. But for a variety of business reasons, it's becoming harder for Hulu to hold onto those shows. So Hulu is increasingly also a home for TV shows that it can call its own -- ones that haven't been on other networks before. That's the face it wants to show the world. On Wednesday, Hulu announced a lineup of programming for the New Year that it says is its most extensive to date. 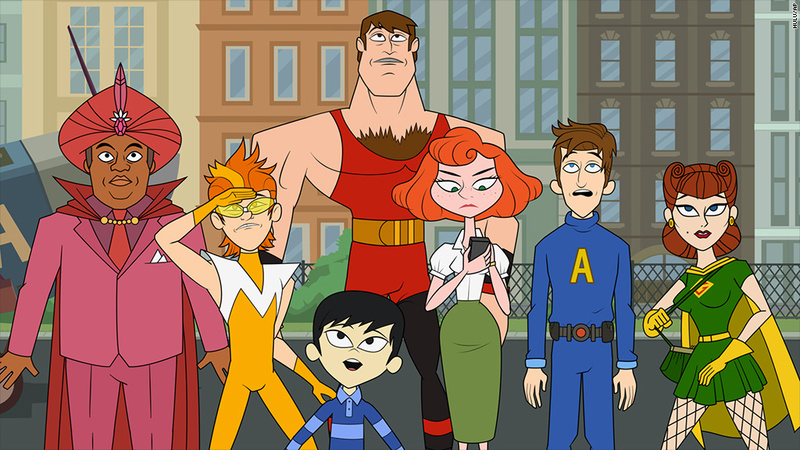 Among the announcements were second seasons of three shows it launched in 2013: "The Awesomes," "Behind the Mask" and "Quick Draw." Hulu also set a premiere date, April 9, for "Deadbeat," a supernatural comedy that it is co-producing with Lionsgate Television. With the announcements, Hulu is seeking to promote its original programming — just like Netflix, its much bigger rival — and move the spotlight away from the shows it "borrows" from other networks. Earlier this week, ABC placed new restrictions on the TV episodes it provides to Hulu: previously, episodes of shows like "Scandal" were up on Hulu for free the morning after they premiered on television. Now the episodes are only available the next day to people who pay for Hulu's monthly subscription service, called Hulu Plus, or who log in through a participating cable or satellite distributor. The episodes are available for free a week later. Fox implemented similar restrictions 2011. In essence, ABC and Fox are trying to keep paying subscribers — whether to cable or Hulu Plus — happy and encouraging more people to pay. So it's only logical that Hulu wants to emphasize its original shows. The Web site's first in-house original show, Morgan Spurlock's "A Day In The Life," was released in August 2011. Since then it has launched a number of modest but interesting series, like the election comedy "Battleground" and the British import "Moone Boy." Hulu said Wednesday that the second season of "Moone Boy" will debut on the site sometime this spring. "Initially, we were very successful at doing premium content distribution for other people. And as time went on, it made sense for us to have things that were uniquely and distinctly ours," Koh said. She said Hulu is "really grateful" to have repeats from the networks of its owners as well as partners like the CW and Univision. Those repeats often bring people through the proverbial door: "It's sort of like the supermarket," she said, "you always go in because you know you're going to buy some milk, but you might try some new brand of cookies." But she said that broadly speaking, Hulu is "moving from being a pipe that carries other people's stuff to a service that has a personality and more of a personal relationship with our end user. And I think that's an important evolution for us as a company." So far Hulu's original programming team has tried comedies and documentaries. Koh said "we want to try more robust and ambitious projects, and that includes hopefully doing one or two serialized dramas." Hulu is not yet profitable, but it is growing rapidly: at the end of 2013 it announced that it had achieved one billion dollars in annual revenue for the first time. Behind the scenes, the new chief executive of the joint venture, Mike Hopkins, is trying to convince television distributors to use Hulu as a front door of sorts for the television industry's "TV Everywhere" efforts, a catch-all term for accessing TV shows on smart phones, tablet computers and other devices. But the original programming push could live side by side with that. In July, when Hulu's parents backed away from a plan to sell the Web site, they said they would invest another $750 million into it, partly for programming acquisitions. "They want to commit more, both to original content that we make and that we buy," Koh said, calling the new investment "motivating" for employees. I asked Koh about Netflix, since the service — which has 30 million paying subscribers in the United States, versus Hulu's four million paying subscribers — gained so much recognition in 2013 for original dramas like "House of Cards" and comedies like "Arrested Development," both of which were nominated for Emmy Awards. Netflix has been busy promoting the second season of "House of Cards," which will premiere in February. Amazon, too, is starting to introduce original TV series like "Alpha House," which premiered in November. While all three services are approaching original TV "slightly differently," Koh said, "the great thing is we're all doing it together at the same time. So I think that helps shift the consumer mindset about how to look at streaming." So does Hulu have Emmy hopes of its own? When asked if Hulu would like to be nominated this year, Koh said, "Of course we would." One of the most interesting pick-ups by Hulu on Wednesday was a second season of "East Los High," a series about a fictional high school that features an all-Latino cast. Production of the first season was funded almost entirely by nonprofit organizations and was acquired by Hulu; the Web site was happy with its performance, so it's actually financing and developing a second season. Another series picked up on Wednesday was "The Hotwives of Orlando," a parody of Bravo's "Housewives" franchise. It is produced by the same studio that created the Emmy-nominated series "Burning Love."